Above: Marietta Wetherill photographed at the World’s Fair in St. Louis in 1904. 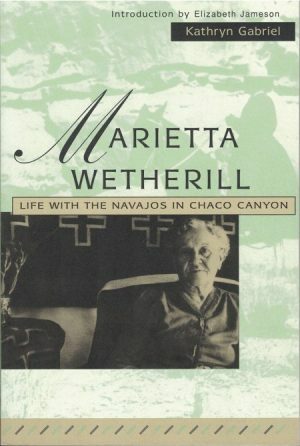 The following is the first chapter in my book, Marietta Wetherill, Life with the Navajos in Chaco Canyon. First published in 1992 and reprinted by the University of New Mexico Press in 1997, this is a first-hand account of life in the Puebloan Ancestral ruins of Chaco Canyon in what is now northwestern New Mexico. Married to Richard Wetherill, the rancher and novice archaeologist who ran a trading post in Chaco Canyon from 1896 until he was murdered in 1910, Marietta Wetherill got to know her Navajo neighbors as intimately as an Anglo could. While Richard was excavating at Pueblo Bonito, Marietta managed the trading post. She befriended a singer who adopted her into his clan and gave her a close-up view of Navajo medicine and religion. In the 1950s Marietta recorded her oral history, which was later archived and transcribed by volunteers at the University of New Mexico. More than 2,000 typed pages were edited and annotated into this book, Marietta Wetherill. It is still in print and is also available in many libraries across the United States. I was adopted into the Navajo tribe when I was twenty-two and living in Chaco Canyon with Mr. Wetherill. The Chee clan, one of the sixteen original clans to have climbed out of the earth into this world, was chosen for me on account of the white blood in my veins and the fact that I would want to eat fish and eggs and pork and other food denied all the other clans.1 There were many things that the Chee clan were allowed that the others were denied. The Chee clan was more worldly. 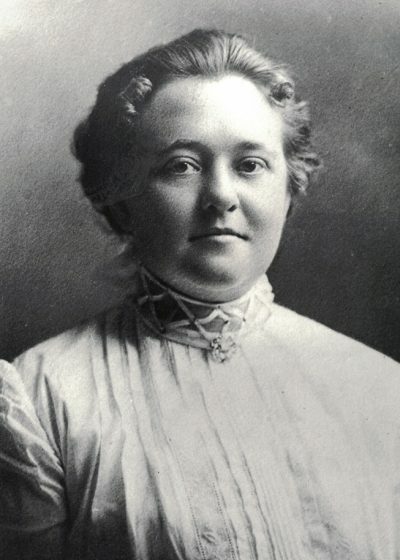 Hosteen Byal adopted Marietta Wetherill. The clan adopted me through blood transfusion and it was the most excellent opportunity to get blood poisoning.2 Yei Tsosi, the medicine man performing the ceremony, scratched me on the top of my arm back of my thumb, just a little scratch about a quarter-inch long, and it showed a little blood. Then he scratched the inside of the arm of the medicine man that was adopting me, old Hosteen Bí’al.3 Our scratches were bound together with a buckskin string. Our hands held little bags of cornmeal and little bags of pollen. Yei Tsosi touched our feet, our knees, our hands, our mouths, and the top of our heads with an ear of corn and then sprinkled those places with corn pollen. It took about a half hour. And so went that ceremony of the blood transfusion the first day, and the second day another little scratch was made, and the third day another little scratch was made. Our arms were bound together those three days, and then I was a Navajo, and I have those scratches on my arm now. One shows pretty good, on account I kept peeling off the scab, but the others don’t show so well. Hosteen Bí’al’s family was there, his five wives and their children, who didn’t pay much attention to me. They hummed a little hymn. They hoped that this child would grow up to be a good child, would grow up to be thought of highly by the People, as they called themselves, would help the Diné in any way she could, and that they would help her in any way they could. They would tell her many things that other people didn’t know about the Navajo so that when she was among white people, she could tell them how the Navajo lived. They weren’t bad people, they weren’t thieves, they didn’t go on the warpath and try to hurt the white men. They hoped that this child would grow up to be a good child, would grow up to be thought of highly by the People, as they called themselves, would help the Diné in any way she could, and that they would help her in any way they could. They would tell her many things that other people didn’t know about the Navajo so that when she was among white people, she could tell them how the Navajo lived. They weren’t bad people, they weren’t thieves, they didn’t go on the warpath and try to hurt the white men. Mareitta Wetherill’s husband Richard was murdered in Chaco Canyon in 1910. Actually, the Navajo wanted to adopt Mr. Wetherill because he was giving a sick man a yeibichai at our house. Mr. Wetherill was too busy in the ruins to be adopted, so I volunteered.4 I became the daughter of Hosteen Bí’al; to all intents and purposes I belonged to him. I was his child and he was always good to me and did many things for me and told me many things that I’ve always appreciated. I think that probably having the blood transfusion was one of the reasons I felt I wanted to do something for the Navajo tribe. And since I’m an old lady now, I find that so much has been written about them that hasn’t been intelligently done. The real Navajo had a reason for everything and no one has ever written about that. She put her arms around me. “You’re a real Navajo.” Of course, they never would have said Navajo. They called themselves Diné, the People. How many times had I seen Tomacito riding on his horse over the mesa, whip in one hand, singing at the top of his voice. I don’t think in all the things I’ve seen in my life I ever saw anything that impressed me quite the way it did to see a Navajo sing. Tomacito, he could be a half a mile off and I’d still hear him. He’d sing low, then come up high, and then come down low again. “My grandmother is getting old and she’s not very well but the children are all right and the sheep are fat and the grass is growing and the Great Spirit is sending the rain.”5 I’d see Hosteen Hataalii Nez Begay come over the mesa and go down into the canyon, and I’d know then that Mocking Bird Canyon was going to have a little sing. The hogans, or houses, were scattered throughout the Penestuja country south of the Chaco. Here’s one in the canyon, there’s one up on the rimrock, and another one over here four or five miles away. 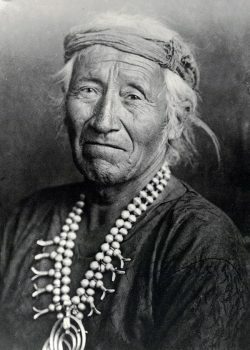 A runner would spread the news that Hosteen Hataalii Nez Begay or some other medicine man was going to stay all night and have a little bijí, a one-day ceremony. The neighbors would come and have coffee and a bite to eat and a visit, and the medicine man would tell them what was going on in the community. If I took the notion, I’d go to the ceremonies my clan had. If the babies were asleep and I had a good girl looking after them, why I’d get on my horse and go singing up the canyon, too. I was welcome because I was part of them. One time thirty or forty children were there and I sat down with them. The squaws came out and sat by me. Then the medicine man came along and asked each child, “What did I sing at your hogan?” The kids were scared to death and they cuddled up to their mothers and cried. The clowns, dressed ridiculously, switched them a little bit and the medicine man said, “Next year you remember what 1 told you. If you ever want to sing in the big yeibichai you’ve got to remember what I teach you.”6 It was like kindergarten. Then he asked me what he sang at Mocking Bird’s bijí and I hummed it to him and he rewarded me with a silver concha for remembering the song. The squaws laughed and hugged and patted me. “See how the white people remember?” the medicine man would say. “Her head’s round and she remembers and she’s going to tell all these things some day to the white people. As soon as she gets back to the house she’s going to write to it all down.”7 Which I never did. Father sent me to the Chicago School of Dramatic Art to study elocution when I was a child. The man there said he never saw anything like my memory. He said, “I only gave you that piece yesterday and you have all twenty-odd verses. How do you do that?” I couldn’t solve a simple problem in mental arithmetic if my life depended on it. I never studied much; it was hard work. Anything I could commit to memory was easy for me. I had civil government letter perfect, but arithmetic and deportment kept me back. If we were on a trip in the Southwest or someplace like that, my parents would put us in school for a couple weeks just to see if we were progressing in our studies at the right pace. They told us if we weren’t, they’d send us to school back in Kansas. I’d memorize the textbooks so that wouldn’t happen. The medicine men wanted me to see and learn everything so that I could tell the white people. One of the things I learned was that the Navajo were superstitious. When we first went to Chaco Canyon there wasn’t a Navajo living there, not a one. They herded their sheep in there but they didn’t live in the canyon. They lived up on the mesa tops and the rimrocks. They did camp at the end of the canyon where it opened out into that great vast country and also in the canyon that went straight south out of Chaco. We always called that the [South] Gap because we could look straight south for miles. But they never lived in the canyon and when I asked them why they said it was crowded with the souls of too many dead people there. Those ruins were on Mr. Wetherill’s homestead claim and the agreement was that when they made Chaco Canyon a national monument, he would turn over to the government all the land on which the ruins were and they could give him land someplace else around there. At least they made Chaco Canyon a national monument [in 1907], which was exactly what Mr. Wetherill wanted, but he never lived to settle the claim. 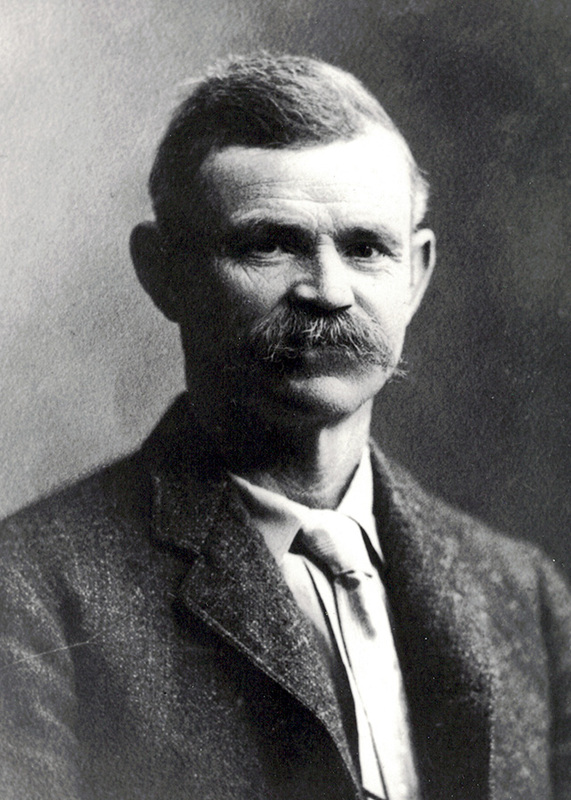 Mr. Wetherill was known all over the world for his work. He had his work in every museum in the United States and in foreign countries. He was not only an explorer but an adventurer, too. He had discovered the Mesa Verde cliff dwellings. He had developed Chaco Canyon a hundred and fifty miles from Albuquerque and there hadn’t been two people here that had ever seen it. He put it on the map. His name is in all the scientific books written on Chaco Canyon. When Mr. Wetherill was killed, we put the body on the back porch and the Indians came and sang and danced around him. He was later buried up the canyon from Pueblo Bonito and there are as many as twenty graves there now because so many Indians wanted to be near him. They didn’t want to kill him. They went to their hogans that day and talked all through the night about how they could have done it differently, but the Navajo didn’t kill Mr. Wetherill. Those Indian agents, both white men, killed him. They wanted control of Chaco Canyon. They promised the Navajo they would build a school there and dam up the canyon for enough water for all their cattle and horses if only they made Mr. Wetherill go away. I’ve had people question my sanity for loving the Navajo after what they done. I can’t condemn them all for one accident of wrath. I never blamed the Navajo for what happened to my family. I’ve lived among the Indians all my life and I always wanted to know all about them. That was the thing … my life. I always said that was what I was going to do, I was going to study Indians all my life, and I came very near doing it. Now that I’m old, I’m going to tell you the story of the Navajo, as intelligently as I can. 1One version of the Navajo legends is that when Changing Woman, a mythological deity, made human beings, she created six groups who formed the original clans. Marietta mentions the sixteen original clans often and once drew pictures of them. The number four, or multiples of four, carries great significance in Navajo numerology, and a reference to the sixteen original clans hasn’t turned up in published ethnology, nor has reference to the Chee clan and eating restrictions. 2When the story of her adoption was first published in Scribners Magazine in May 1932, Navajos wrote letters denying that they adopted non-Indians in this type of ceremonial, but she insisted it was true. 3Those who perform curing ceremonials are called hataalii, or singers, or chanters. “Medicine man” is a title imposed on the position by whites. A sing is usually done in conjunction with sandpainting and dancing in costume. 4Yeibichai, also ye’i bichei, is a dance in the Night Chant or Night Way in which dancers wear masks of the Yeis, or gods, the male and female figures who represent the forces of nature. 6Some whipping does occur in initiation into certain rites. 7The Navajo had flat heads because they kept their babies strapped to cedar bark cradleboards. Aleš Hrdlika, a physical anthropologist noted in 1908 that questions pertaining to intentional deformation met with laughter. An older woman said the Navajo doesn’t like a head that protrudes behind, illustrating the words with her hands. 8The dead are considered the source of chidee, or malevolent ghosts. The ruins are called kits’iil, and are the Anaasázi Bighan, Home of the Ancient Enemy, who contributed to the destruction of the Fourth World. These sacred places figure prominently by name in their origin legends, or Diné Bahane’, and are considered to be báábázid, literally “for it there is fear and reverence,” because of the supernatural forces still lingering around them. Only specialized persons can approach these ruins. But not all Navajos believed this way, hence the looting of the ruins.